Big brands realize they need so much more than a picture and description to sell products. They're all about selling a lifestyle, and that means bigger, better content is needed to engage shoppers. 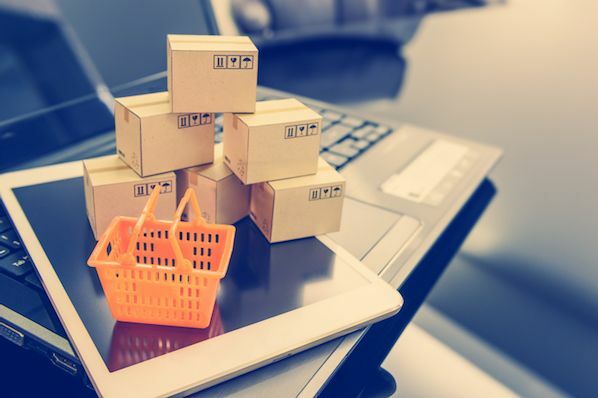 If you're not sure what that looks like, or how you can use creative content in your ecommerce website, we have seven spectacular examples for you from real ecommerce campaigns. Recreational Equipment Inc. (REI) is one of the most popular camping and outdoor sports retailers in North America. 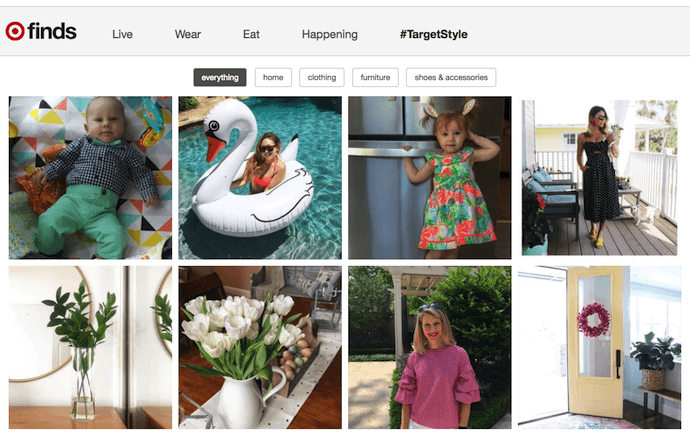 No, its lifestyle blog isn't the difference-maker for them -- it's how the business natively builds this content into the shopping experience. The company sorts its products by type of outing, and includes expert advice on each product as a resource in the dropdown menu so you're learning as you buy. Browsing climbing shoes? 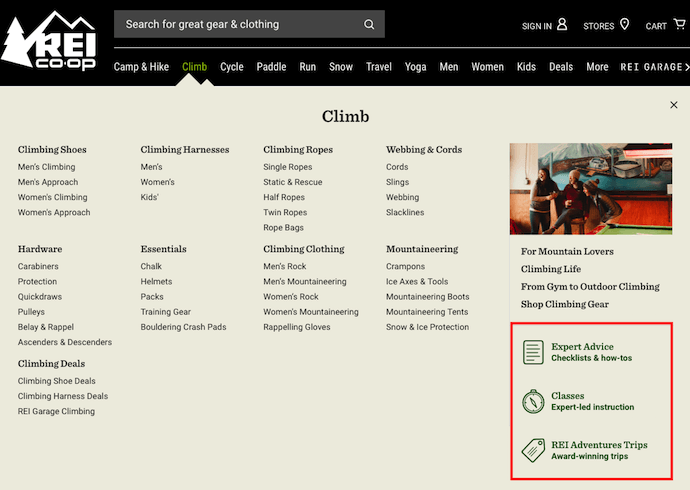 There's how-to content linked to the bottom right for you to learn which shoes you need and even how to use your carabiners once you hit the mountain. 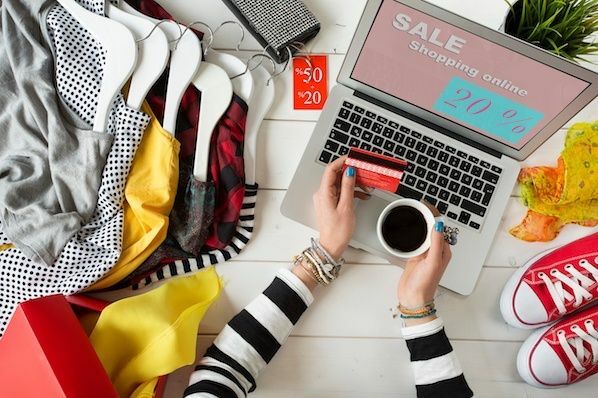 Check out this guide for even more ecommerce content ideas. The power of social is real, and Target knows it. That's why they have their Finds page, with information about the most popular items their customers have posted to their Instagram Story. At a glance, buyers can see what others are in love with at the moment, and that "Insta" proof goes a long way toward prompting a conversion. 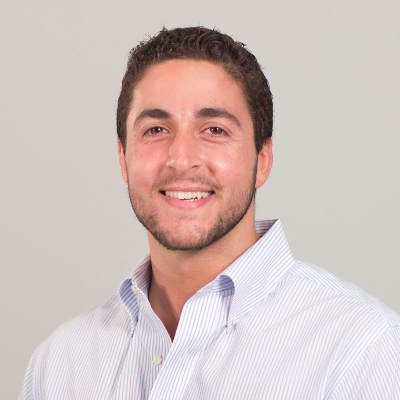 Like Target, GroPro has a huge following of self-motivated content creators too. But while Target's customers take to Instagram to show off their purchases, GoPro's fans are uploading some of the coolest action videos on YouTube -- all from the perspective of GoPro's famous Hero camera. 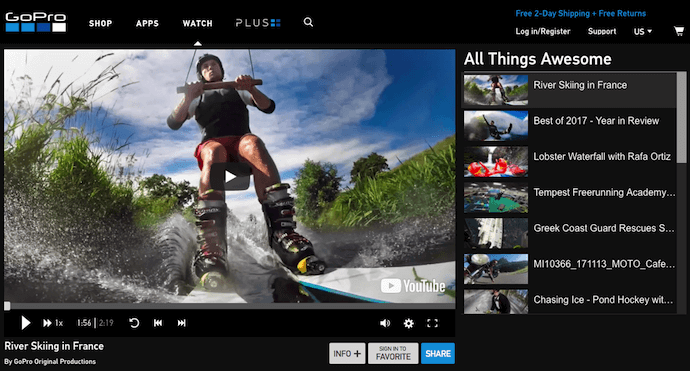 The company engages its users to collaborate and even republish their video content to the GoPro YouTube channel -- as well as GoPro.com. When your customers shoot video for you, using your product, it'd be foolish not to turn it into an ecommerce content strategy. Music is the universal language. Kudos to Burberry for speaking to all through their Acoustic series. Not only do they entertain and delight page visitors with the sweet sounds of popular musicians, but they also get a lot more credibility for their brand. After all, every artist who agreed to perform for the acoustic series was pretty much saying "Burberry's cool in my book." And that's hard to ignore. You can't think about tech-based ecommerce without thinking about Best Buy. 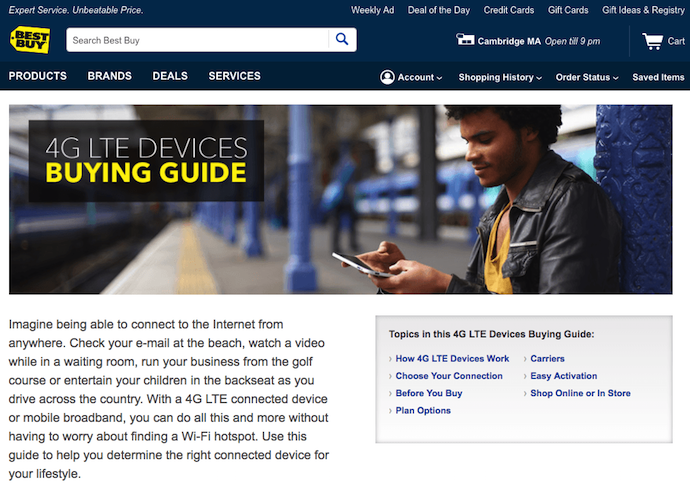 This consumer electronics giant nurtures its website visitors through "Buying Guides," allowing users to start with a tech tutorial before entering the product's purchase page. The company educates users gradually with calls to action (CTAs) carefully placed throughout each web guide. Most consumers' pet peeve would be receiving a product and finding out it just doesn't look the same in real life. Video is a great way to show buyers what they're really getting. 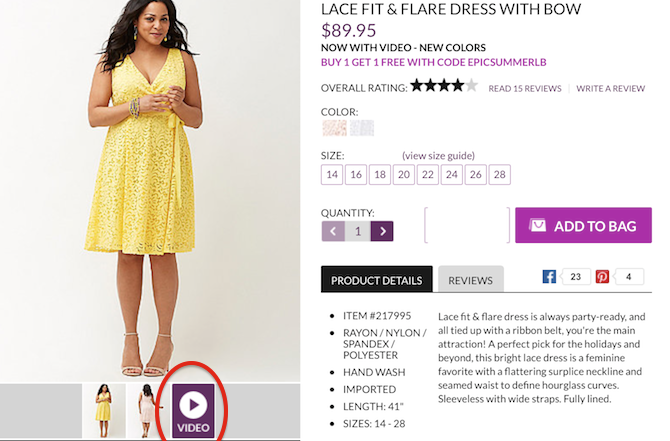 Lane Bryant has put video to work within product descriptions, showing what the clothes look like while in motion. It's information buyers need before they make a final decision. 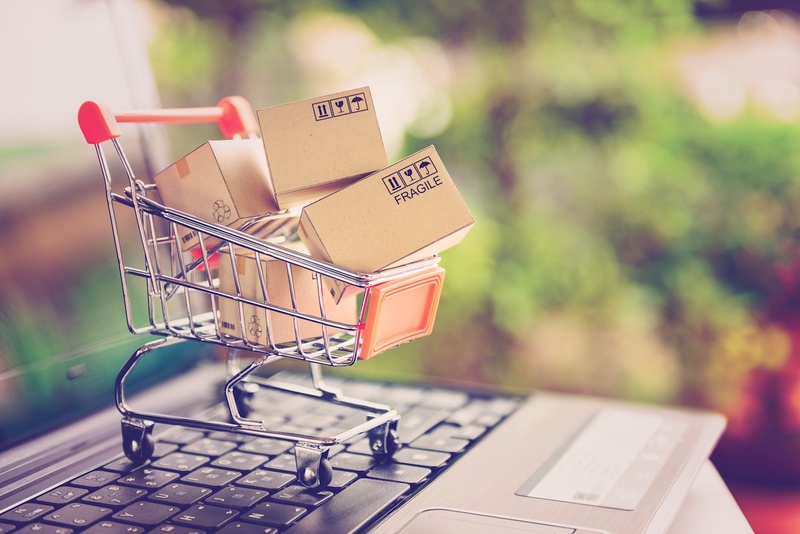 Using a bit of creativity with something as simple as your product descriptions can really add some excitement to an otherwise run-of-the-mill ecommerce site. Woot.com is well known for their silly product descriptions from some of the most creative copywriters in the business. Even the smallest injection of humor can bring visitors back every day with hopes of seeing something new and different. Which of these creative content ideas would work for your ecommerce company? Have you put some of the ideas into practice in the past? We'd love to know what brings you results, so let us know in the comments.